After put in more than 35 years of service, I am retiring from Bank’s service today and I am saying “ADIEU” to the Bank .After having spent most of my life time in the Bank as well as in the Trade union front, parting is indeed a painful affair. I had the unique opportunity of leading the Federation as Frontline soldier. At this sunset hour in Central Bank of India, when I look back very many memories overwhelm me. It was a long and eventful journey. I have made every effort to be as selfless as possible while attending to the problems, difficulties & miseries of our members. I have never hesitated to call a spade a spade whenever situation warranted so. Fear or consequences have never deterred me from upholding the cause and the interest of the officer’s community. The Curtain Raiser of the year-long Golden Jubilee Celebrations of AICBOF was held at K.C.College Auditorium, Mumbai on 22nd February 2014, with all pomp and colour. The function was a grand success and will remain a memorable event for years to come. Shri Raj Kiran Rai, General Manager –HR, Shri R.C.Agarwal, Shri Dilip Saha, Shri R.R.Kumar, Shri N.K.Pareek and Shri D.S.Bhadauria along with your General Secretary and President were called to adorn the dais. The programme was set in motion with a heart stirring, melodious invocation song by Udaan Orchestra run by Physically disabled brethrens. BUT ARE THESE MEANT TO PROFIT THE PRIVATES? We reproduce hereunder the contents of our CONFEDERATION Circular for the information of all officers. “Congratulations Friends – we are elated to note the unprecedented success of the ‘Two Days’ All India Bank ‘Strike’ on 10th and 11th February 2014 for which call was given by the UFBU. We congratulate all the members all over the country for their enthusiastic participation in various programmes conducted in this regard at different centres and making the programmes a grand success. We are receiving reports from the organizers on the programmes / rallies held throughout the country and their total success. It is also observed that the participation of the members was not mere enthusiastic presence but their overwhelming emotion depicting the frustration and anger for the denial of reasonable and rightful wage increase. The bank employee unions had rejected the Indian Banks Association's (IBA) offer of a 10 per cent wage hike during a conciliation meeting held on February 6 with the Chief Labour Commissioner. The IBA is a body that represents managements of banks. The offer made by bank managements was not in line with rising inflation, General Secretary of National Organisation of Bank Workers Ashwini Rana said. The IBA on its part said that the banks could not afford to a wage revision beyond 10 per cent due to growing non-performing assets in the their balance sheet coupled with provisioning of pension liability, according to a statement on the website of All India Bank Officers Association. 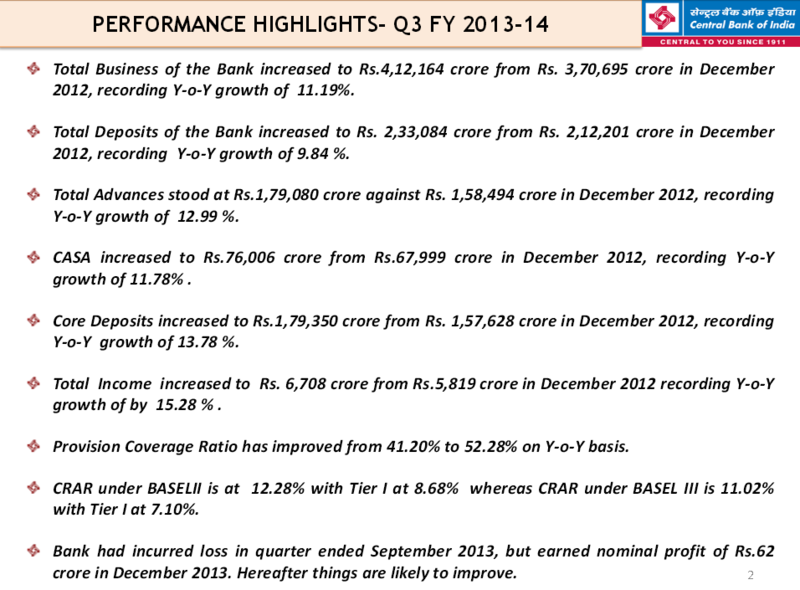 The 10 per cent hike in wages would have cost the banks nearly Rs. 3,000 crore. Finance Minister P Chidambaram, speaking at the 78th foundation day of Indian Overseas Bank, said, "It cannot be that all profits are used to declare dividend and to provide enhanced wages and allowances to bank employees." A significant part of retained earnings must be used to infuse additional capital, otherwise banks will not find the amount of capital that is required over the next 5, 10, 20 years, he said. The employee unions of public sector banks are demanding for a nearly 30 per cent increase in wages. The All India Bank Officers Association also called for "regulated working hours for officers, 5 days a week and compassionate ground appointment", according to a statement on its website. The staff of public sector banks had earlier gone on a nationwide strike for a day, on December 18, instead of proposed two days, after discussions on wages with the IBA had failed. The bank unions had cited forward movement in the wage talks for deferring the "48 hours strike" to 20th and 21st January 2014. 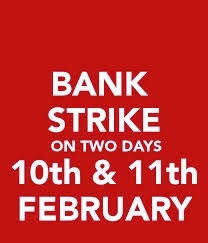 Despite eight round of talks between bank employee unions and IBA to break the impasse and the strike was subsequently deferred to 10th and 11th February 2014. There are 27 public sector banks in the country with a combined employee strength of about 8 lakh and network of about 50,000 branches across the country. சம்பள உயர்வு உள்ளிட்ட கோரிக்கைகளை வலியுறுத்தி நாடு முழுவதும் வங்கி ஊழியர்கள் இன்றும் நாளையும் வேலை நிறுத்தப் போராட்டத்தில் ஈடுபட்டுகின்றனர். 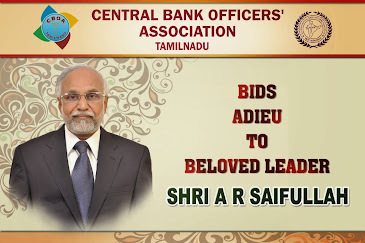 வங்கி ஊழியர்களுக்கு ஏற்கெனவே போடப்பட்ட ஊதிய ஒப்பந்தம் 2012 அக்டோபரில் முடிந்துவிட்டது. அதன்பிறகு புதிய ஊதிய ஒப்பந்தம் போடவில்லை. எனவே, புதிய ஊதிய ஒப்பந்தத்தை விரைவில் போட வேண்டும். சீர்திருத்தம் என்ற பெயரில் வங்கிகளை தனியார்மயமாக்குவதை தடுத்து நிறுத்த வேண்டும். சுமார் 2 லட்சம் கோடி வரையுள்ள வாராக் கடனை மீட்க நடவடிக்கை எடுக்க வேண்டும் என்பது உள்ளிட்ட கோரிக்கைகளை வலியுறுத்தி 2 நாள் வேலை நிறுத்தப் போராட்டத்துக்கு வங்கி ஊழியர் சங்கங்களின் கூட்டமைப்பு அழைப்பு விடுத்துள்ளது. அதன்படி, நாடுமுழுவதும் இன்று (திங்கள்கிழமை) காலை 6 மணிக்கு வேலைநிறுத்தம் தொடங்கியது. வேலைநிறுத்தத்தில் 25 பொதுத்துறை வங்கிகள், 12 தனியார் துறை வங்கிகள், 6 அயல்நாட்டு வங்கிகள், 40 கிராமிய வங்கிகளின் ஊழியர் களும் பங்கேற்கின்றனர். நாடு முழுவதும் சுமார் 8 லட்சம் பேர் வேலை நிறுத்தத்தில் பங்கேற்க வுள்ளனர். Public sector bank (PSB) officers seek pay parity with Government officers. Public sector bank (PSB) officers are seeking pay parity with Government officers. "If higher pay scales to Government officers is considered just on the grounds that such compensation will not corrupt them or allure them to receive bribe from the public, why not apply the same yardstick for officers of public sector banks, where the incidence of such allurement is much higher?' argue industry sources. Comparing the Fifth Pay Commission recommendations for Government officers with the proposed hike offered to PSB officers, the General Secretary of All India Bank Officers' Confederation Harvinder Singh said 'there is no justification on the Government's stand'. “The IBA made an initial offer of 5 per cent salary increase on 'pay slip component', which was enhanced to 9.5 per cent after the Unions gave a strike notice and the Central Labour Commissioner intervened to avert the strike. In the next round of discussion on January 27, the IBA improved the offer from 9.5 per cent to 10 per cent, which was considered ínsultingly inadequate' and we rejected the offer. The last salary revision for PSB officers was 17.5 per cent of establishment cost, which after factoring for superannuation costs and non-salary components of establishment cost left 11.43 per cent for appropriation towards pay-slip increase. Since establishment costs have soared, the average pay slip increase was 21.52 per cent. "Inflationary pressures coupled with the erosion in purchasing power, is adding to our woes. We deserve adequate compensation, an increase which is more than the offer made during the last salary revision on pay slip cost. Only such an increase would help reduce the pay slip difference of PSB officers vis-a-vis Government officers, he said, seeking pay parity with Government officers. Raise age of retirement to 65? NEW DELHI: A parliamentary panel has urged the Centre to raise the retirement age to 65 years, noting that growing lifespan was adding to the need for "productive ageing". The recommendation for increase in retirement age comes with a reminder that senior citizens would form 12.4% of the total population in 2026 from 7.5% in 2001. 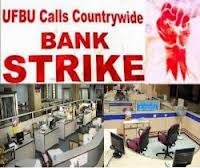 NEW DELHI: Employees of public sector banks will go on a two-day nation-wide strike from February 10 as unions and management have failed to reach a consensus on wage revision. 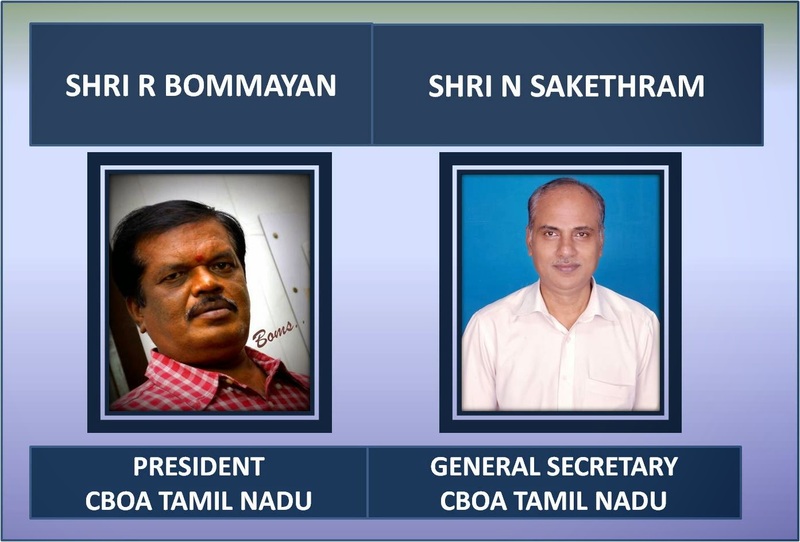 "The conciliation meeting before the Chief Labour Commissioner between the unions and Indian Banks Association (IBA) failed to find an amicable solution," United Forum of Bank Unions (UFBU) Convener M V Murali told PTI. So, UFBU has decided to go on two day nation-wide from February 10 to press for higher wage revision, he said.